The inspiration was a dish I enjoyed immensely at Gerarda’s in Tagbilaran, Bohol, a couple of weeks ago. 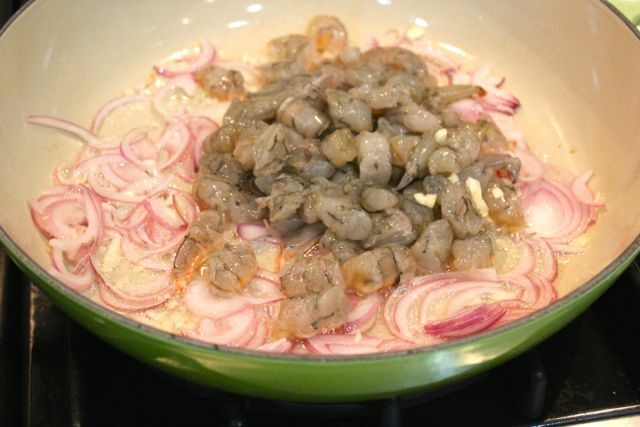 Their version was made up of thinly sliced kinampay (a variety of ube or purple yam unique to the island of Bohol) with some sautéed shrimps and onions. It was surprisingly light (yam can be leaden when waterlogged or cooked) and delicious. I wanted to see if we could make a version at home. I purchased some local ube from the Nasugbu market, a huge hunk of yam, and when we looked at it raw, it seemed improbable that it would cook through after being thrown into a pan with a shrimp sauté. So we made (apparently the first wrong decision), to blanche the ube first or parboil it to semi cook it through. Then we cut it into cubes (the second wrong decision apparently) that were double or triple the thickness of those in the original dish. 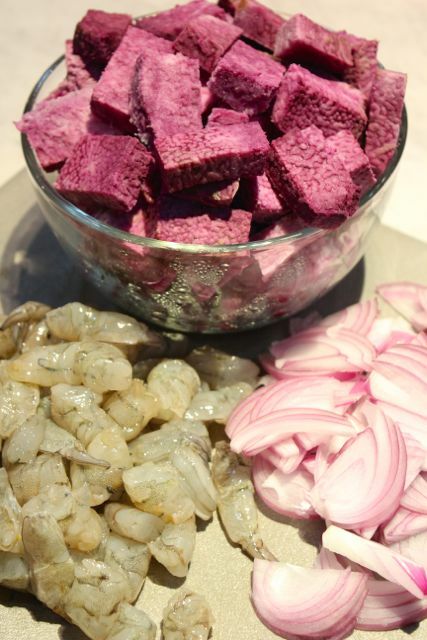 We peeled roughly half a kilo of fresh putian or suahe (shrimp) and cut those into smaller pieces. 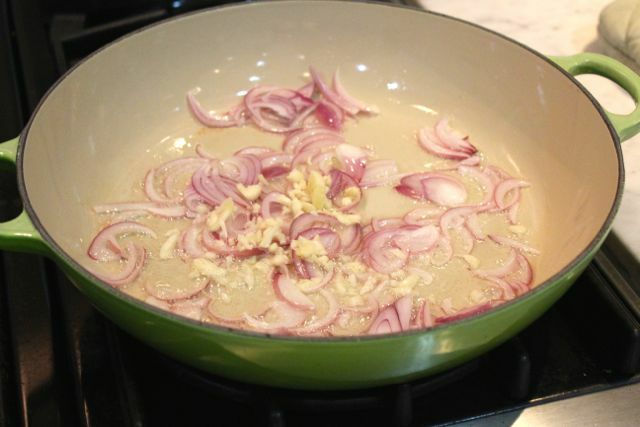 I decided to use slivered red onions and some minced garlic as well. On the side, in a small sauce pot I boiled the shrimp peels and heads in some water with salt for a simple shrimp broth. In an enameled cast iron pan (perhaps the third mistake as it just retained too much heat and helped to overcook the dish eventually) I sautéed some garlic and onions in vegetable oil. Added the shrimp and waited for it to turn color, stirring gently for a minute or so. 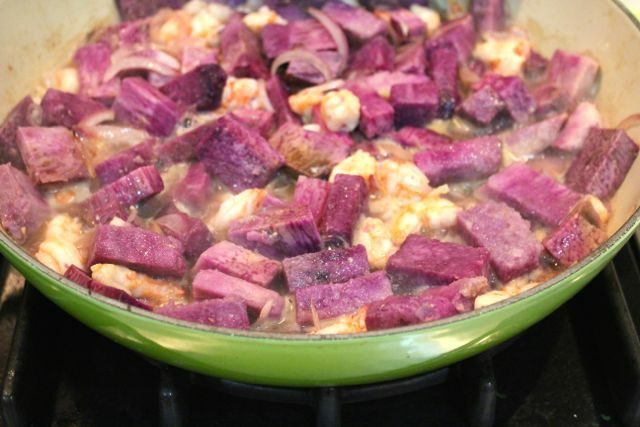 Added the cubed ube or yam and about half a cup or more of shrimp broth and stirred gently over medium high heat. Season with salt and pepper and with some dismay, watch it turn a little more mushy than the inspirational dish that I had based it on. :) It tasted fine, but that’s about it. So here are some tips in case you wish to try this at home. If possible, use the hard-to-find kinampay variety of ube from Bohol. Slice it into small thinner (say 1/4-13 inch thick) slices. Do not bother to parboil the ube, it will cook even in a quick sauté. Don’t bother to make the shrimp broth, you may just need to add a little water to the sauté instead. 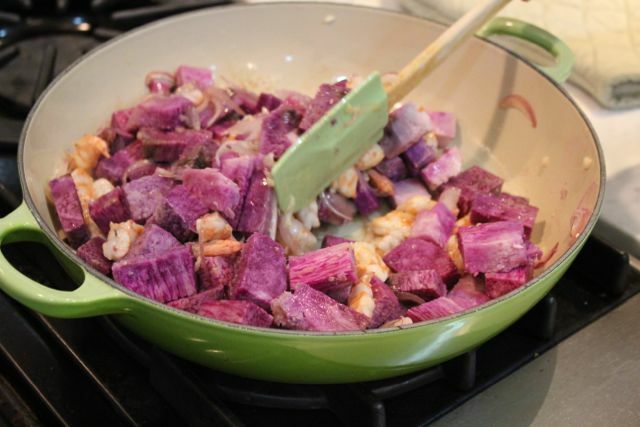 Use a lighter frying or sauté pan that doesn’t retain too much heat after cooking. Think of this perhaps more as a quick stir fry, though you will have to test the yam to ensure than it’s done. Am waiting for other readers’ comments as to how to cook this dish properly. I remember my mother cooking a dish like this before but never watched her make it. And I remember it to be very good. Thanks for trying and sharing your experience. Never tried a dish like this, but I like your green enamel pan. I am jealous. Love that hue and the color combination with the purple yam. Wonder if you use the purple	camote instead. Wow, you certainly got a good bargain, but that was 2007. That price would get you just one oval braiser these days! Recently, in a grocery store, I found an orange no brand oval braiser which could pass for a Le Creuset. A knock-off for $28 and it has served me well despite a negligibly misaligned lid.